Portable players have made it possible to enjoy our favorite music and videos anywhere we go, and at any moment in time, livening up, for example, our journey on public transport or allowing us to share our multimedia files with our friends, and all this in a very simple way. But portable devices sometimes use specific formats adapted to their characteristics. That is why if you want to use a portable device to play the videos you have stored on your hard drive, you will first have to transcode the files to the specific format. To do so, you can use iSkysoft iPod Movie Converter. 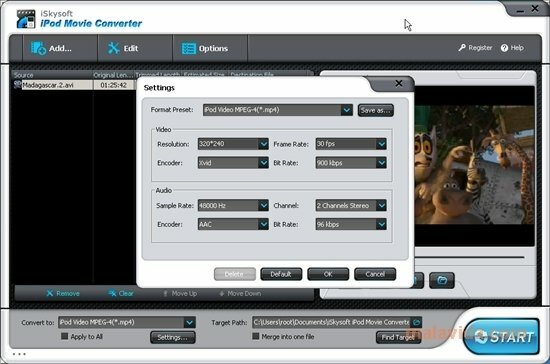 iSkysoft iPod Movie Converter transcodes any video to the multimedia format used by some common portable devices, to be more specific MP4. Thanks to its intuitive interface, en just a few clicks you will obtain files that are ready to be played in any of Apple's wide variety of portabel devices: iPod Touch, iPhone, iPod Nano, and many others. 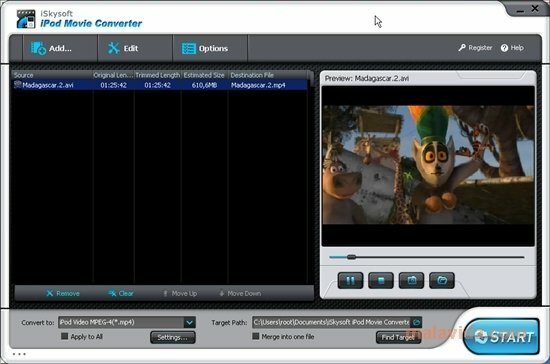 This application accepts a great quantity of input formats (MP4, MOV, 3GP, AVI, WMV, RM, MPEG, ASF, FLV) and produces a multimedia file that is completely compatible with any of the players in the iPod range. Furthermore, it offers some editing options, like combining two or more files in one, and setting the videos brightness, contrast and saturation.